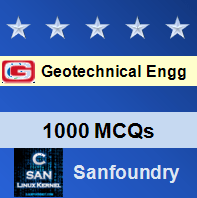 This set of Geotechnical Engineering online quiz focuses on “Minimum Depth of Foundation: Rankines Analysis”. Explanation: The gross pressure intensity q is the total pressure at the base of the footing due to the weight of the superstructure. where σ̅ is the effective surcharge at the base level of the foundation. 3. The net safe bearing capacity is defined by which of the following equation? Explanation: The net safe bearing capacity is the net ultimate bearing capacity divided by a factor of safety F i.e., qns = qnf/F. Explanation: Sometimes, the safe bearing capacity is also referred to as the ultimate bearing capacity qf divided by a factor of safety F.
Explanation: Rankine considered the equilibrium of two soil elements, The first one immediately below the foundation (element 1). Explanation: According to Rankine’s equation bearing capacity of cohesion less soil is zero at the ground surface. 7. When a state of equilibrium is reached under the footing? Explanation: When the load on footing increases, and approaches a value qf, a state of plastic equilibrium is reached under the footing. Explanation: Rankine considered the equilibrium of the other soil element (element 2) beyond the edge of the footing, but adjacent to element 1. 9. During the state of shear failure, which of the following principal stress relationship exist? for cohesion-less soil,σ1 = σ3 tan2 α. 10. The symbol σ̅, represent which of the following term? Explanation: σ̅ represents the effective surcharge at the base level of the foundation, assuming total unit weight for the portion of the soil above the water table and submerged unit weight for the portion below the water table. To practice all areas of Geotechnical Engineering for online Quizzes, here is complete set of 1000+ Multiple Choice Questions and Answers.